It should be consoling to every sick person to know that he or she does not suffer alone. Throughout the world, others are afflicted as well. All of us, by our crosses and trials, can assume an active role in the work of redemption. St. Peregrine, miraculously healed of a cancerous wound, assisted Christ in this noble apostolate of suffering through his own experience of illness and pain. There is significance in the fact that St. Peregrine was healed at the foot of the cross. The miracle might have occurred in a sick bed or a shrine. But it didn’t. 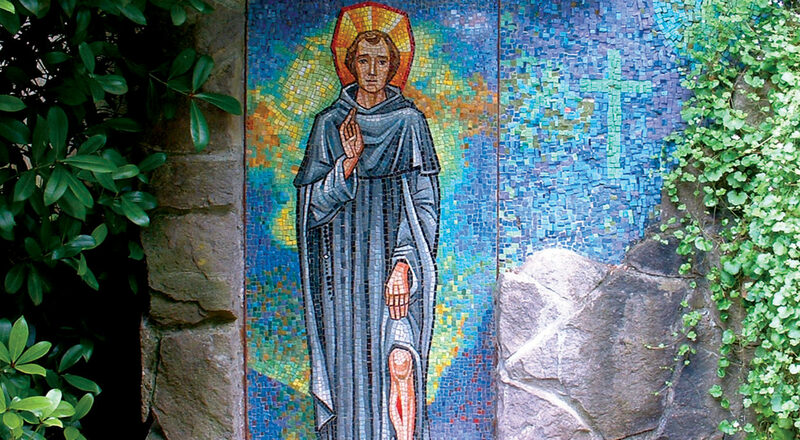 St. Peregrine’s healing took place before the cross where all who are sick must eventually find themselves if they wish to participate in the redemptive action of Jesus Christ. you experienced human weakness and the pain and suffering of sickness. that they will be a true source of healing and comfort to all people. Like you, we also turn to God in our suffering. and the love that God has for each of them. and to give life to the full to everyone. and put their trust in your saving help. send your healing grace to them. that you will teach us the wisdom of the cross. that we may never lose confidence in you. following the example of Saint Peregrine. but shall have life to the full. good health and the light of consolation. who now count on your great saving help. as once you send healing on him. Be our true doctor and remedy sure. And help us to face all the troubles of life. may our faith never fail. so that my weak and sick body might be well and strong again. I may live every day in service to you and the Church. every glory and honor forever and ever. Additional prayers may be found on the National Shrine of St. Peregrine Facebook page. Please “like” our page in order to receive inspirational prayers and information daily. Each week Mass is said for the many intentions that we receive at the National Shrine of St. Peregrine. You can have your petitions remembered in this Mass by writing the Shrine Director in Chicago or by sending a prayer petition via the link below. Please be sure that you send us the actual names so they may be properly enrolled on our prayer lists. Click here to view petitions and pray for others’ intentions. The St. Peregrine Shrine at The Grotto, The National Sanctuary of Our Sorrowful Mother, located in Portland, OR, celebrates a St. Peregrine Mass on the first Saturday of each month at noon in its Chapel of Mary. For more information about the St. Peregrine Shrine at the Grotto in Portland OR, click here.